A monument is primarily artistic or commemorative in nature and is associated with a specific event or person. Plans, drawings, or photographs must be submitted to SPCR for review. The size, scale, quality, and appropriateness of content and location of the proposed monument will be considered. A marker is generally made of stone and simply marks the location of a significant event, place, or person. Markers contain an inscription that identifies its purpose. The Wyoming Landmarks Commission placed many markers in the 1950s – ‘60s. Plans, drawings, or photographs must be submitted to SPCR for review. The size, scale, quality, and appropriateness of content and location of the proposed marker will be considered. These fall into four types that are determined by the amount of information to be conveyed depending on whether the reader is on foot or in a vehicle. Upright signs can be placed in nearly any situation. Angled signs are used most effectively as interpretive signs. They can be used singularly or grouped in combination with an upright, either stand alone, or attached to an upright kiosk structure. SPCR will make the final determination on which class of sign is most appropriate for the site. SPCR has traditionally placed standardized signs that are cast aluminum and framed on either side by 12-foot and 7-foot high posts that are bolted together. These signs measure 4’ x 6’. 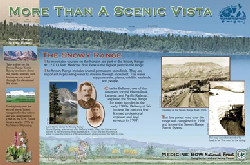 A wayside interpretive exhibit contains interpretive panels or kiosks with panels and is located along roads or trails. 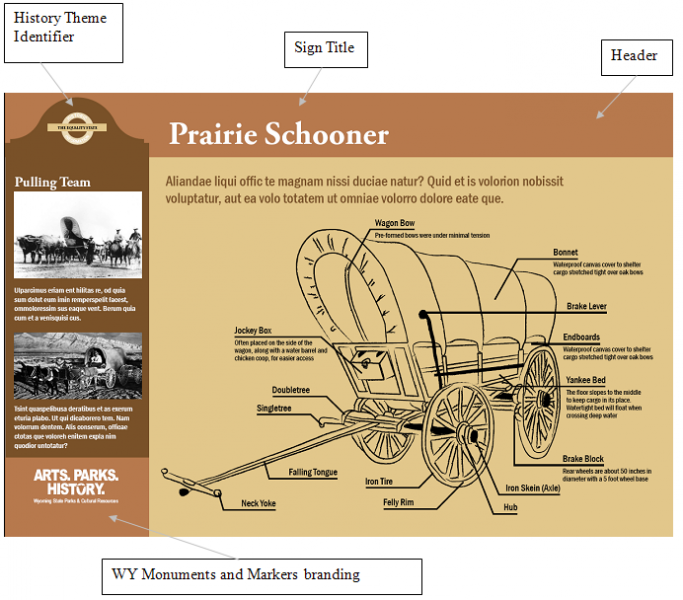 Interpretive signs are smaller, low profile, and contain more graphics and less text than the traditional historical signs. Standard Frame: (pic) pedestal mount with rustic style supports to match traditional historical markers. Template: SPCR has developed a sign template to be used in most cases. Please contact the Monuments and Markers program coordinator to discuss sign design. Safety. It is expected that travelers will need to pull off the road to read the signage, and then reenter the highway; they must be able to do so conveniently and safely. Hence, signage must be placed so that it does not block drivers’ lines of sight when making turns or create traffic hazards when travelers stop to read the signage. Signage also must be placed where they are least likely to be struck by motor vehicles or otherwise endanger motorists or the signage. Curves, industrial or commercial intersections, congested areas and similar hazardous places should be avoided whenever possible. Visibility. The signage should be placed in a safe but relatively high-traffic area, so that the largest possible number of travelers can read it. Given the choice between a secondary road and a primary road, the signage will be placed on a primary road. Signage is not permitted on interstate or other limited access highways, except in rest areas. Location. Ideally, the signage should be placed as close as possible to the site it commemorates. Sometimes, however, because of traffic conditions, the remoteness of the site, or other reasons, the signage must be placed some distance away. Cost efficiency. It is more cost effective to place the signage at an existing turnout or wide shoulder rather than construct one. Sometimes, however, it is necessary to clear a pull-off area, because signage cannot be read from a moving vehicle. Placement on private property. State signage is usually placed in WYDOT rights-of-way or on public property. Under special circumstances it may be placed on private property (usually because of highway conditions) if the owner gives WYDOT, in writing, access rights for maintenance purposes. Placement on State Property. When signage is placed on State property, including the WYDOT right-of-way, ownership of the signage must be turned over to the State of Wyoming. A Memorandum of Agreement between the State Historic Preservation Office, WYDOT (if applicable), and the signage proponent will be created. SPCR’s budget often does not provide for the manufacture of new markers. In the past, the manufacture of markers, and frequently the materials for signposts used to erect markers, has been paid for by private individuals or organizations. If an organization or group is interested in placing a new monument or marker, they should be aware of the associated costs. Approximately $2700 - $3500 will be necessary to cast a traditional historical marker and additional installation costs may apply. Approximately $1,000 - $2,000 will be necessary to fabricate an angle mounted sign. The State of Wyoming then assumes ownership of the signage, erects, monitors, and insures them. All signage will be considered in relation to budgetary allowances and long-term costs assumed by the State. SPCR will consider the associated cost of the placement of the signage and will inform the sponsor of the anticipated cost prior to the approval of the sign. All associated costs will be the responsibility of the sponsor. The sponsor of the marker should consider contacting Wyoming Office of Tourism to apply for a grant to place an interpretive marker and/or develop a new highway turnout. If SPCR declines a subject for a state historical marker, it may be an appropriate topic for a local or private marker. Several counties, cities, and historical groups have in place local historical marker programs for marking places of local and regional significance. Please see Appendix B. Individuals or groups are free to pursue the purchase of privately funded markers or plaques. Such markers must be placed on private property outside the highway right-of-way and may not use the same sign brand identification used by the State. Private signage is not considered part of the official state marker program. The Monuments and Markers program commemorates facts, persons, events, and places prominently identified with the history of the nation, state, or region. Each proposed marker text shall be reviewed and edited by the coordinator of the marker program and the staff of SPCR and, with the location, shall be approved by the SPCR Monuments and Markers Advisory Committee. No signage shall be erected to commemorate a living person. In order for an historic event to be eligible for commemoration with signage, the event must have occurred at least fifty years ago. Likewise, a place or person must have attained its significance at least fifty years ago, although there are exceptions if the event, place, or person is of extraordinary historical significance. 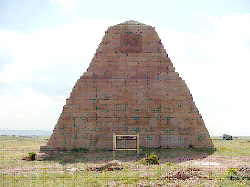 It is recognized that many people, events, and sites are important to the heritage of Wyoming. 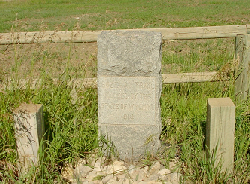 Because of limited locations available for signage and the cost of manufacturing and erecting new markers and insuring them, SPCR will consider placing new signage only if the subject matter of the marker illustrates and clarifies the role of a person, organization, industry, site, building, or event that played a significant role in Wyoming’s history. has yielded or is likely to yield information important to history or prehistory. Text must be historically accurate and developed using available published sources. If possible, an expert on the sign topic will review the proposed text for content and SPCR staff will correct any historical inaccuracies. Sign content should rely upon historical fact and avoid local myth or folklore. A list of references should be included with the submission of the proposed text. The program strives to inform people from all backgrounds about Wyoming’s history. Therefore, the text of signage should provide the reader with significant and meaningful historic information about the subject addressed by the signage and should be written as if the reader has no previous knowledge about the subject. To ensure stylistic consistency among state signage, SPCR staff will revise and edit draft texts. The goal is to provide as much accurate and interesting information as possible in a limited space. Sponsors can assist us by following these suggestions when writing their drafts. Aim for no more than 25 lines of text containing no more than 82 to 86 character spaces per line. Spell out numbers less than 10, otherwise use Arabic numerals (one, two, etc., or 10, 599, 34,987, etc.). Do not use honorary titles such as Mr. and Mrs., but do use and abbreviate occupational titles and ranks (the Rev., Col., Maj. Gen., Dr., etc.). On first use, give a person’s full name as he or she used it or as it is best known (e.g. Alexander Graham Bell; Maggie L. Walker), but on subsequent use only the last name. For advice on writing concisely and vigorously, refer to the Elements of Style by William Strunk Jr. and E.B. White. The text should be submitted with the understanding that it will likely undergo further editing and revision by SPCR staff in consultation with the sponsor or original author. What was the cause and effect? What changes or consequences occurred and why? How did the subject influence the course of events? What and how widespread was the impact? How was the person, place, or event of statewide or national historical significance? What was the subject’s lasting influence in history? What role did the subject play in their area of significance? What factors contributed to the subject’s development? Contact the State Historic Preservation Office (SHPO), Monuments and Markers Coordinator, Natalya Lenz(307-777-6401). Check on the need for your proposed marker before taking further steps in the process. Research and Write the Marker Text. Research the topic by consulting multiple primary and secondary sources. Write a roughly 150 - 250 word text, following the “Monuments and Markers Writing Style” (see above). It is often helpful to seek assistance from local and regional historical associations and governmental entities in researching and crafting the proposed text. Please see Appendix C: Text Writing Assistance for a list of contacts. Also, examples of recently approved marker texts can be requested from the SHPO to assist you in the writing process. NOTE: changes likely will be made by the SPCR staff to the proposed text to meet marker criteria. Suggest a Suitable Marker Location. The marker preferably should be placed on public land or a highway right-of-way; if it is on private land then SPCR must receive the owner’s consent for access to monitor the sign. See, “Criteria for Marker Placement,” when choosing a location. WYDOT will give final approval for the marker’s placement if it is within the WYDOT right-of-way. Please see the Marker Placement Approval form to complete this process (Appendix A). Submit Your Application Packet to SPCR for Review. Applications must be submitted by May 1, September 1, and/or December 1 of every year. Follow the instructions provided in the application for completing it. Please see the Monuments and Markers Application form (Appendix A). If you have any questions, please contact Natalya Lenz (307-777-6401) at the State Historic Preservation Office. After reviewing a topic, if MMAC determines it is not eligible for a state marker, the sponsor will be promptly notified. Work with SHPO in Revising or Refining the Marker Text. Before submitting a text to MMAC for approval, an editorial review committee made up of staff members of SHPO will review the text. Any major questions about the text that arise will be discussed with the sponsor, including further documentation, if necessary, to support the marker text. If changes to the text are warranted, SHPO’s staff will work closely with the sponsor – or the sponsor’s author – to produce a mutually agreed upon text. Because SPCR and MMAC bear the ultimate responsibility for what appears on a marker, they reserve the right to edit a text for accuracy, clarity, brevity, and thoroughness. MMAC, under the supervision of the Director of SPCR, has the final authority on wording. Evaluation of Application by the Monuments and Markers Advisory Committee. Applications are evaluated three times every year by an advisory committee made up of members with varying areas of expertise in the field of Wyoming history. The application will be evaluated for historical accuracy, inclusion of interpretation and analysis of the subject of the nomination, demonstration of an understanding of historical context, and appropriateness of the documentation provided. The application must be accurate and supported with documentation provided. The MMAC considers many applications and may be unable to consult sources listed in the application, so it is imperative to include pertinent photocopied excerpts from valid primary and secondary sources, along with citations. Limit material to less than 20 pages and wisely choose the information that relates most directly to the focus of your application. Pay for the Manufacture of the Signage. SPCR will notify the foundry/fabricator that casts the marker/sign and provide it with the final board-approved text. The foundry will bill the sponsoring organization directly upon shipment of the marker to the appropriate SPCR office for installation. Also, in certain situations, the sponsor may be responsible for covering the expenses associated with installing a sign. Transfer Ownership to the State of Wyoming. A Memorandum of Agreement with the State of Wyoming, the monument/marker proponent, private landowner (if applicable), and the Wyoming Office of the Attorney General must be created. The Memorandum of Agreement will transfer ownership of the marker to the State of Wyoming. Long term maintenance costs, repair costs, and/or replacement costs are the responsibility of the marker proponent. Please see Transfer of Ownership Form. The State Historic Preservation Office will draft the Memorandum of Agreement. If you have any questions please contact Dan Bach. Hold an Unveiling Ceremony (if desired). Scheduling of a ceremony should only be done by the sponsor after SPCR and the fabricator can confirm a realistic shipping date for the signage. SPCR also asks that it be notified of the time and date of any dedication ceremony so that one of our representatives can attend and make a few brief remarks. SPCR Commission members and MMAC members will also receive an invitation to dedication ceremonies. Usually, the department in consultation with the sponsor sends out a press release to local media announcing the ceremony. 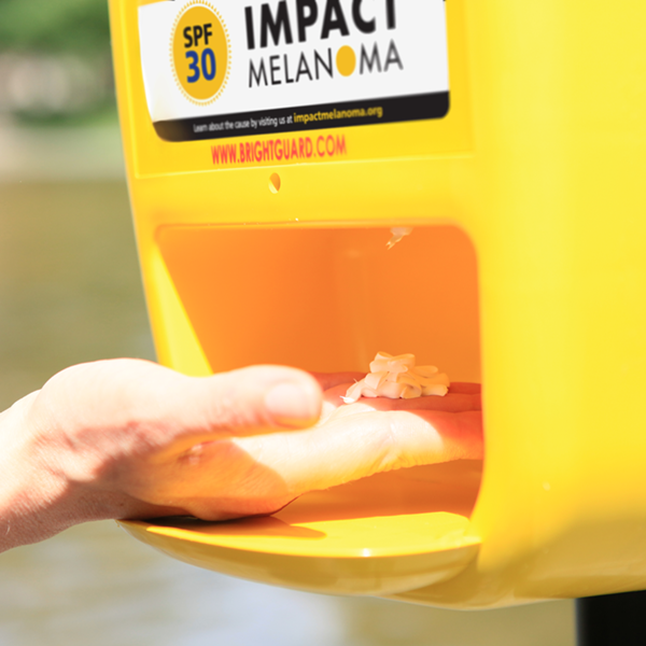 If signage is not manufactured and installed after five years of its approval by the MMAC, SPCR may choose to identify another applicant and/or sponsor or withdraw its approval of the application. Subject to the procedures outlined here, SPCR may work with a new individual or group to install the marker. Applications will be reviewed three times a year. Applications are due May 1, September 1. and/or December 1 of every year for consideration. This schedule is in effect for applications for new markers and new marker text only (which includes a turnout approval application). All other marker activities requiring the completion of a request or approval form will be handled by the SHPO office on a case-by-case basis. The Monuments and Markers Advisory Committee will evaluate each application according to the marker criteria outlined in section III.A and those found below. The goals of the evaluation process are to articulate a standard that exemplifies the enduring cultural and historical values represented by monuments, markers, and wayside interpretive exhibits. Adequate funding sources (either Government or Private) are necessary to ensure the required signage standards are met.